the lower limbs are the ones least protected from the elements, something that seems a tad strange, when you consider the lengths to which the world's major cycling apparel providers have gone to waterproof, windproof and make breathable our upper torsos. it's maybe a tad unfair to phrase things in this manner, for there are indeed copious numbers of waterproof trousers on the market but, so far as i know, not a one from the professional or amateur pelotons have succumbed to the need to wear. it seems perhaps a logical requirement that the uci require mudguards/fenders during the spring classics, but i sincerely doubt there is any legislation that could be put in place requiring the pelotonese to don waterproof trousers should this year's paris-roubaix prove wet and muddy. i do have, squashed into a rather overburdened drawer, at least two pairs of bibtights that proffer at least minimal protection from unexpected precipitation, but usually only on the front of my cast steel thighs; rarely on my posterior and likely not on the shins or calves (however well developed they may be). thus we have the pelotonese clad in winter caps, helmets, waterproof jackets and ending in neoprene overshoes to keep those ten little toes appropriately dry and toasty. for though an appropriate pair of water resistant overshoes is as much a necessity for a wet sunday morning ride as is a bicycle and a pair of mudguards, the two large holes cut in the soles of same tend to mitigate against totally impervious waterproofing. and it cannot have escaped your notice these days, that shoe manufacturers are less concerned with keeping water at bay than they are at offering substantial ventilation. i own more than one pair of bona fide cycle shoes the tops of which resemble little more than canvas. 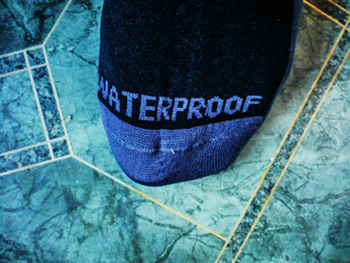 therefore, if rain and surface water make it past the constitution of the overshoes, as they undoubtedly will at some point during the ride, there's little defence against cold and wet tootsies. and that is precisely the reason for a pair of waterproof socks. latest kids on the block are the crosspoint socks from portland's rainproofing experts, showers pass. resembling a pair of long, chunky, woolly socks. 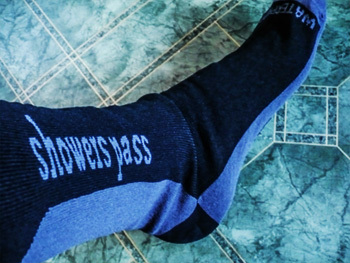 the folks at showers pass prefer the epithet mid-calf, but i may make this a smidgeon clearer by pointing out that the top of the socks quite happily met up with the hem of my bib-threequarters, well past the top of any overshoes in my possession. the crosspoints comprise three distinct layers; that chunky grey exterior, an artex waterproof and breathable membrane and a coolmax fx lining. you would figure that socks consisting of these three layers would necessitate moving up a size in cycle shoes, but i'd no bother wearing them with a pair of dromarti leather shoes, or dmt and mavic offroad shoes. they also fitted perfectly comfortably with both mavic and rapha road shoes. 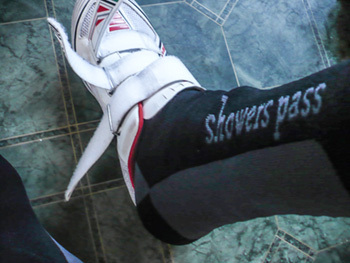 but comfortably fitting socks are part and parcel of everyday cycling life; the showers pass crosspoints promised more. along with many others, i have experienced more than my fair share of cycling apparel that hasn't quite matched its reputation. a bit like car advertising, listing a top speed in excess of 130mph safe in the knowledge that few, if any, will ever achieve such alacrity on british roads. and that allied to an average mpg of 81.2, neglecting to mention that this was attained by a professional driver, motoring at a constant 56mph on the utah salt flats, assisted by a tailwind of 35 knots. not exactly lying, but being more than economical with the truth. 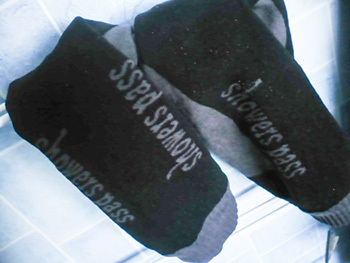 however, i have great respect for the folks at showers pass, with every confidence that if the toe of each sock plainly stated waterproof then that's precisely what they'd be. however, there's always that nagging little suspicion at the back of my pedals. so, to remove all possible doubt, i set out in less than clement weather, devoid of any seasonally compulsory overshoes, and wearing cycle footwear with the waterproofing qualities of a sieve. this involved propelling myself into a nagging headwind, bringing perpetual stinging sleet for well over forty minutes, coupled with splashing through gallons of surface water. on my return home, the shoes were wet enough to require being stuffed with newspaper to dry them out, and the thick woolly exterior of both socks were determinably wet. yet not only were both feet pleasantly warm, they were completely dry. the end of hyperbole as we know it.